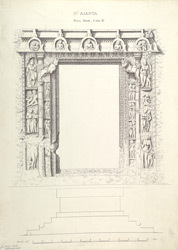 Illustration of a hall door from Cave IV at Ajanta from James Burgess' 'Original Drawings from the Buddhist Rock Temples at Ajanta.' The Buddhist cave temples of Ajanta were excavated into a horse-shoe shaped cliff overlooking the Waghora River in the 2nd?1st Century BC. Cave IV dates from a later phase of excavations from the late 5th Century and is the largest monastery at Ajanta. It consists of a columned verandah with two cells at either end of the verandah. The hall is entered through three doorways, the central one is decorated with divine figures, guardians, couples and Buddhas.